The DOUBLE RACE double cans-holder belt is designed to meet the most demanding requirements. Its unique adjustment system will provide you with optimal stability and support for your equipment. Its modularity allows you to carry the equipment required for Trails, but also the essential equipment for outdoor activities (water, small raincoat type GORE-TEX®, nutrition etc….). Perfect balance between lightness and stability, it offers optimal comfort for the Trail, long mountain bike rides and multi-day hikes. Anatomical fit with unique adjustments: 2 velcro straps for hip and waist support to adjust your belt according to its capacity and size. Belt sold with 2 x 600ml cans. For added safety, Oxsitis belts are equipped with a whistle that is easily accessible without a belt and reflective strips. 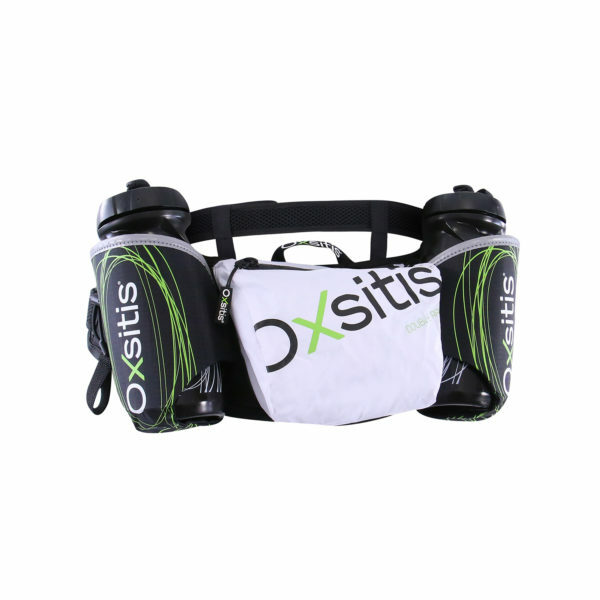 Oxsitis belts are made of technical materials with water-repellent properties. Advice on canister maintenance: Suitable for boiling water or dishwasher after each use. The cans are 100% recyclable consumables whose wear will depend on your use. We recommend that you renew them every year, depending on how often and how often you use them.